All the power and tonal bliss of the original in an unbelievably tiny pedal. So much chorussy goodness in such a tiny pedal? People have been chased out of town for less, but they're telling you, they did it! If THAT sounds to good to be true, wait until you hear this pedal! Lush, thick and swirly, in a form factor chorus-smugglers around the world and guitarists with precious little room on their boards would appreciate. TC has condensed an infinite amount of sound into a tiny pedal: From subtle swells to full-on Leslie sounds, the classic SCF sound plus a huge sounding TriChorus and so infinitely more in a tiny pedal! No matter what your chorus-needs may be, you can find just the right sound here - in a pedal that takes up next to no space on your board! 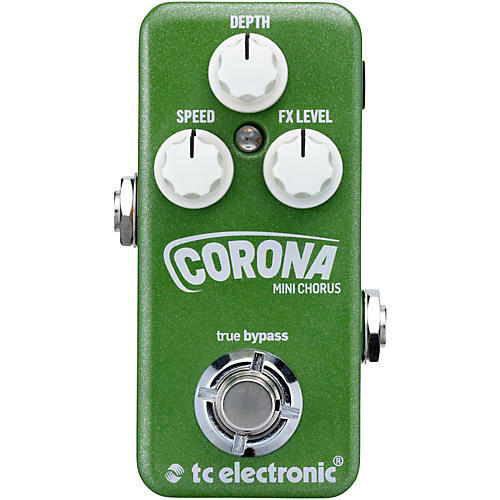 Corona Mini Chorus is TonePrint enabled. This means you get the revered TC sound multiplied to infinity with rockstar-customized versions of the best chorus sounds TC has to offer - free of charge! Did you know that the classic TC Electronic SCF Chorus sound is one of the true staples of music? Still used in every pro-studio and on countless pro guitarists' pedal board, the SCF's beautiful sounds continue to define music. TC has also added a TriChorus, three chorus engines that run simultaneously for a sound so awesome you should wear a helmet the first couple of times you play it... just so your brain doesn't splatter all over the place when the sound blows your mind. You don't have to twist their arm, they'll admit it: TC Electronic has done some cool chorus pedals in the past. But this one is so crammed with awesome they had to check twice to make sure they wanted to unleash it! Tiny yet mighty, this chorus delivers that warm, swirly gooey TC chorus goodness in a miniature footprint. Free TonePrint Editor - Create your own custom chorus pedal. Beam enabled - Send TonePrints to Corona Mini Chorus through their free TonePrint app for iPhone and Android.